Continuity mistake: When Murphy drives into the parking lot to use the pay phone, we see his license plate as 909 KMB. But when the police dispatcher announces Murphy's license plate, it's "909 King Edward Boy" (KEB). 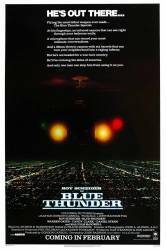 Visible crew/equipment: As Blue Thunder performs its loop just before the bad guy's helicopter is destroyed, there is a shot of him looking around in his helicopter. In this shot you can see the camera helicopter reflected in the glass. Visible crew/equipment: The helicopters are flying low above the streets chasing each other. 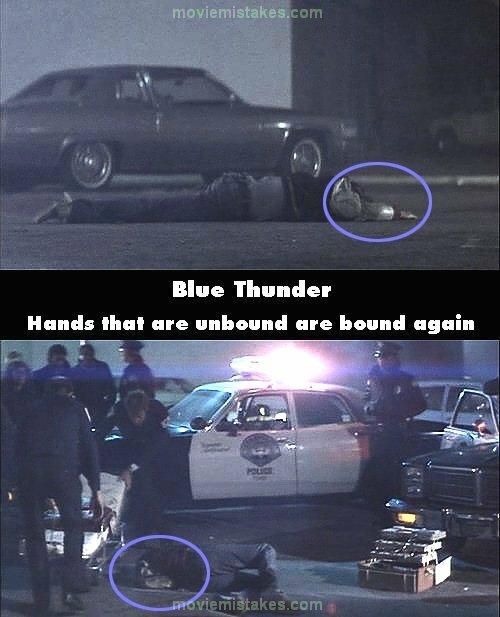 Several forward looking shots show no to very little traffic, and one blatantly shows two cops directing traffic away from the set of the film. Character mistake: Following Lymangood's death, police dispatch radios a BOLO on Murphy, identifying his vehicle as a 1979 Trans Am. However Murphy drives a Turbo Trans Am, only available in 1980 and 1981. Dispatch should have all of his data available.